The next morning Pearl wakes us with breakfast, if you can call it that. "Come and get it! Fresh posssum." "Fresh? It looks like roadkill!" "Of course it's roadkill." said Pearl. "You think I'm going to run after one of those things and bring it down myself? This is fast food." "Apparently not fast enough to make it across the road alive," I mumble. Peppy takes a dainty nibble. "Sorry I don't have a little pink bowl to put it in. Wendy always fed me Doggy Delights. It came in eight different flavors and she warmed it on the stove for me. Turkey with chestnut stuffing is my favorite." "Then you better hope a wild turkey runs in front of a truck," said Pearl. An unlikely trio of shelter dogs make a break for it together, only to find themselves in a town presided over by a syndicate of tough top dogs who run a protection racket centered around the Big Burger franchise's dumpsters. K-10, a loner who trusts no one, plans to set out on his own, while Pearl, a level-headed, much-loved pet separated from her owners, is determined to make sure her friends survive. Peppy, a scrappy but clueless Chihuahua, wants only to return to his life with his doting owner Wendy. K-10 (named by his mom who thought him better than the average K-9), however, is determined to make it on his own. But when he tries solo foraging, he runs into trouble, in the form of Adolf, the canine capo, and Rotter, the enforcer, a Doberman and Rottweiler who run this town their way. The cocky K-10 turns down their "offer you can't refuse" until he finds himself surrounded by a pack of hostile coyotes. "Boy, am I ever glad to see you guys," I say. "I could use a little help." "This is exactly vat vee vere talking about earlier, isn't it, Rotter?" said Adolf. "Yeah, Boss. Dat was our deal, protecting K-10 from stuff like coyotes." "Vee vould be glad to help you if you vere in our pack, but since you aren't, this fight iss none of our business." Adolf turns to leave, and Rotter follows him. "No, wait," I bark. "I've been thinking it over. I was wrong. I'll join up with you.... I'll do anything!" But life with the mob is no walk in the park for K-10. Adolf and Rotter make him the fall guy in a butcher delivery truck heist, and he barely escapes a return to the slammer. Now he's wanted by the dogcatcher and the canine mobsters, not to mention the coyotes, and K-10 realizes that he's not going to make it on his own. If only he could link up with Pearl and Peppy again, but he fears he's burned his bridges behind him. 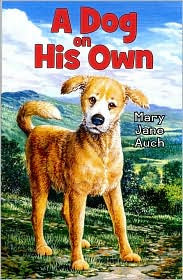 In Mary Jane Auch's A Dog on His Own (Holiday House, 2009), kids will recognize K-10 as a fictional descendant of the merry maverick mutt in Lady and the Tramp,, an appealing half-Lab who depends on his ability to turn on the charm and get himself adopted out of any pound, but, having had his heart broken before, doesn't do domestication for long. As you might expect, however, Pearl and Peppy have a different view of humans, and with their help, even K-10 manages to find his "forever home" in the end. Snappy dialogue and stock but solidly engaging characterizations make this a great read for animal lovers. What is the Setting-Place and Time of this story?